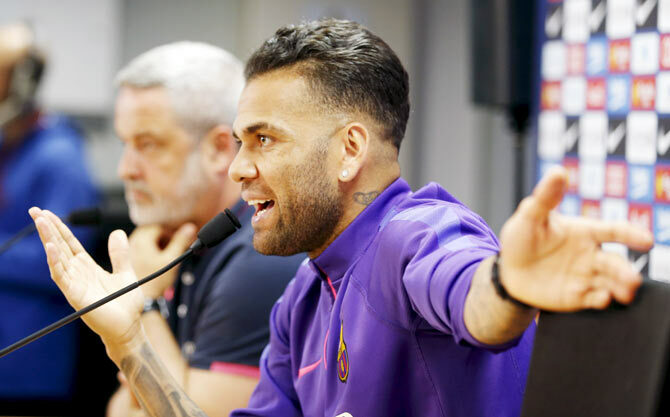 Barcelona defender Dani Alves will focus on Saturday's King's Cup final and the Champions League final a week later before announcing whether he will remain at the club next season, the Brazil international said on Monday. Alves, 32, has yet to sign an extension to his contract, which expires at the end of next month, and the right back could leave for free after seven trophy-filled seasons if no agreement is reached. Treble-chasing Barca have already wrapped up the La Liga title, their fifth since Alves joined from Sevilla in July 2008, and can repeat their treble from 2008-09 with victory over Athletic Bilbao in Spain's domestic Cup final at the Nou Camp and Juventus in the Champions League showpiece in Berlin. "Will I be playing at Barca next season? It's an unknown," Alves told a post-training news conference. "I think there are too many nice things to experience to be thinking about what I have to do," he added. "For the people who appreciate me, for everything involved, and out of respect I am just thinking about enjoying these two finals. "Hopefully we can make history with this club. After that, I will announce my decision." Alves has been a key part of Barca's success in recent years with his probing runs up the right wing and a fine understanding with the likes of Argentina forward Lionel Messi. However, he has sometimes attracted criticism for a perceived weakness in defence and it was his howler that led to Malaga's goal in a surprise 1-0 La Liga defeat at the Nou Camp in February. If Alves and Barca fail to agree on a new deal it could leave the club without a top-class right back as they have been banned by FIFA from participating in the transfer window until January next year. Coach Luis Enrique, who has said he wants Alves to stay, does not appear to have much confidence in Martin Montoya, who has made a mere 10 starts this season, while new signing Douglas has made just two starts. 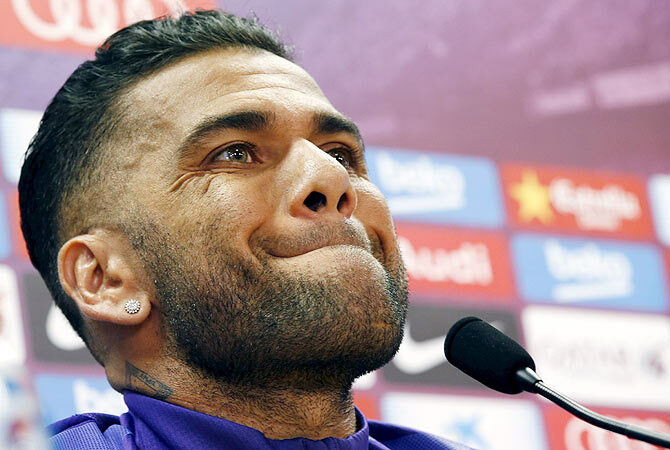 Alves said he had decided to speak on Monday to address what he called "nonsense" published in the media. "I have a limit and my limit has been reached," he told reporters. "My intention was not to speak out but there has been so much nonsense that I had to act."